Do you want to be part of DJ nights and reveal one or two of your favorite dance moves? Well, the modern day youth is very much into music and grooving. They spend most of their time listening to music. It is hard to imagine a world without music and dance for the modern day youth. There is a new music site out there dedicated to live electronic music. This new live electronic music streaming service is called the Hupclub. Anyone who is a fan of DJ sessions would love to be part of the Hupclub music streaming site. This is the site where you will be able to get access to thousands of DJ sessions happening all over the globe. No matter which corner of the globe you are, you can access electronica music from anywhere. This music website is a free to use site. It has been designed and conceptualized with music loving youth in the mind. You can access the live DJ sessions on offer at this site for free. The new music streaming site is the brainchild of Doctor Jekyll, a design and marketing firm in Barcelona, Spain. Jekyll says that their research in music has shown that electronica is the music style that is on a growing spree and the number of people listening to rock and pop is on the decline. The name Hupclub looks to be apt for this electronic music streaming website. It is a name that is in complete sync with its concept. The ‘Hup’ word is a combination of the Hands+Up, which one can relate to while dancing to DJ tunes with hands raised in the air. This is joined with the ‘club’ word to give a new branding to this unique concept. The members of HupClub are given a choice of 4 options to choose from. The music session kicks off with lights, smoke, colors and music, just like what you experience in a dance club. Users will be able to have a glimpse of everything in their Hupclub account through the navigation bar at the side. The members can choose from home, club, private and special event sessions depending on their needs and membership. There would be banners coming up on your screen from time to time to show the latest events, special recommendations based on your music interests and details of the sessions that are presently streamed. This information will help you to not miss a thing on Hupclub. There is also the ‘Hupclub for mobile’ option that you can make use of to feel that you are at home and with your friends during weekends, even if you are far away. The Hupclub offers a simple and easy to use interface that will help you to find the most suited music sessions that you like quickly. 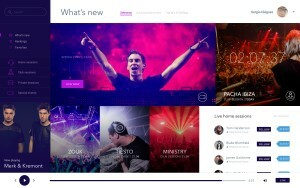 Hupclub is currently on the lookout for investors to help the live electronic music streaming site to take off. The creators of this site are hoping to launch the site in its full glory by the middle of 2016. You can check out Doctor Jekyll site for more details and also to go through few Hupclub case studies. Next Entry: How to Promote your iOS App Quickly on the App Store? Next Entry How to Promote your iOS App Quickly on the App Store?